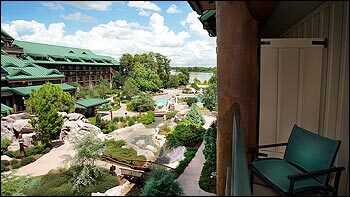 The Wilderness Lodge, an architectural masterpiece on the shore of Bay Lake, is one of Disney's most beautiful resorts. Inspired by the National Park Lodges of the American West from the early part of the 20th century, the resort takes elements from nature and incorporates them into every space. Outside, near the pool, a geyser erupts regularly, adding to the theme. The lobby is grand and jaw dropping, rising up six stories in a huge, open space. Bundled log colums support the massive trusses at the top. On each side, a 55 foot totem pole rises up to keep watch over the people milling about. At the top, four enormous teepee chandeliers provide a soft glow that gives the lobby a cozy, warm feel. In the corner, a 5 story fireplace showcases the rock layers that can be found in the Grand Canyon, and rocking chairs face the fire and provide a wonderful place to unwind and relax. In the corner, bubbling water can be heard. 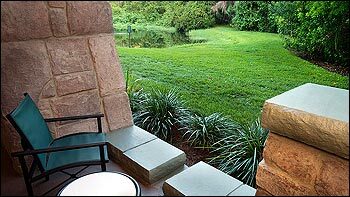 Upon closer inspection, guests will discover the beginning of a stream that winds under a bridge in the lobby before flowing outside to become a larger one that feeds directly into the pool. 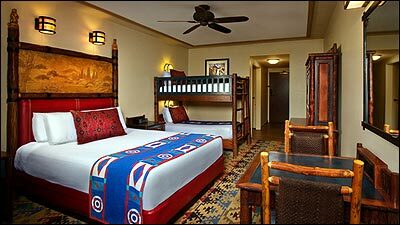 Rustic wooden floors and carpeting featuring Native American desings adds to the western motif. Wrought iron and wood carvings are everywhere, and on each floor, Native American artifacts, art, and western mining equpiment can be found in display cases. This resort houses 725 deluxe rooms. Rooms here are a bit smaller than most deluxe resorts, but the price point is lower as a result. 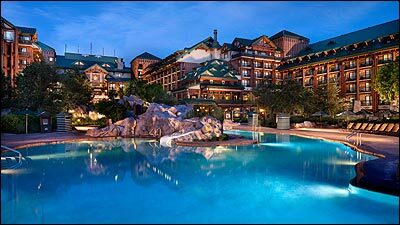 There are two restaurants plus a quick service location, 2 bars, a fitness center (at the adjacent Villas at Wilderness Lodge), 2 pools, 3 spas, an arcade, a child care center, and a gift shop. 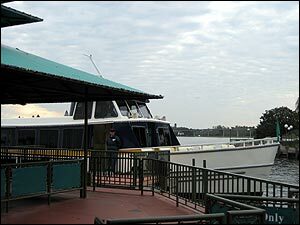 The lodge provides boat service to Magic Kingdom and Ft. Wilderness and bus service to all other locations. The location of the resort is wonderful if you are looking to truly get away from it all. 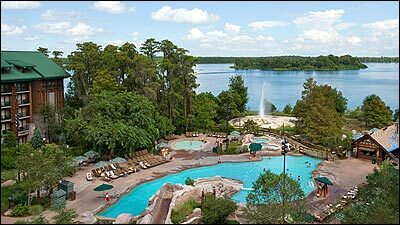 In fact, staying here makes it very hard to "remember" that you are actually in Florida. The resort is shrouded in pine trees and evergreens, and surrounded by wildlife, so it really does feel like it is in the middle of the wilderness. Recreational activities are plentiful here: boating, biking, swimming, and the nearby Ft. Wilderness Campground (connected to the lodge by a mile long path), provides additional opportunities. A lodge tour is given daily--inquire at the front desk for the schedule. Consider being a "Flag Family”. Each day a family can participate in the flag raising on the roof of the lodge. Requests can be made at check in. 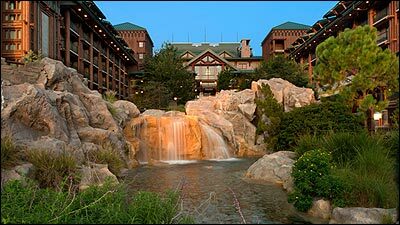 The Wilderness Lodge has long been an Intercot Favorite and it's no wonder why! Room rates range from $289-$598 per night. Club Level rooms range from $515-$985 per night. Rates vary based on season. Rates are higher on weekends and holidays. 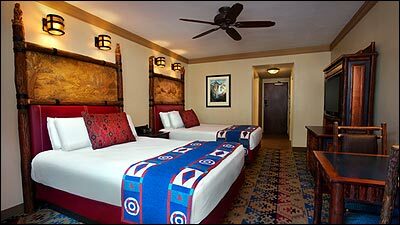 Rooms here are themed to woodlands with Native American decor and accents. The leather and wood headboards feature etchings and engravings of wildlife. Some Disney animals from Pocahontas, Bambi, and Chip and Dale can be seen on the bathroom tiles. These rooms have a repuation for being "dark", but the recent renovations have helped brighten things up a bit. For a brighter room, book a Courtyard View and request a higher floor. Rooms here can be booked with one of three views: Standard, Woods View, or Courtyard View. Some Woods view rooms face the Magic Kingdom and have an excellent view of the fireworks! Number of beds: Most rooms have two queen beds. King bed and bunk bed (one queen plus bunk bed) rooms are available as well. Club Level rooms and suites are available. Accessible rooms are available. Bathroom: The sink area has a double vanity, with the shower and toilet in a closed area. Balcony: Yes. Balconies on the 7th floor are enclosed "privacy" balconies. Occupancy: Maximum four-person occupancy per standard room. If there are more than 2 adults in a room, there is an additional charge of $25 per adult, per night. Suites: Yes -The 31 Deluxe Rooms feature two queen-sized beds or one king-sized bed in the bedroom and a queen-sized sleeper sofa in the parlor area. This suite has all the features of the standard room plus a wet bar. Deluxe rooms come with Club Level access. Club Level: Club Level rooms are located on the 7th floor. In addition to the amenities of standard rooms, these rooms includes robes, DVD players, deluxe turndown service, continental breakfast, afternoon snacks, and evening hors d'oeuvres and desserts with wine and cordials. Advanced itinerary planning is also available. The concierge lounge is open from 7AM-10PM. Seating is available in the hallways overlooking the lobby. Visit our Club Level page for more details and guest feedback. Pacific Northwest inspired fine dining. The dining room is surrounded by large windows that provide a picturesque view of the courtyard area. Wines from the Pacific Northwest region are featured. 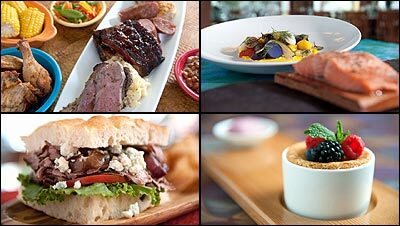 This is a Disney Signature Dining Experience. A raucous dining adventure for the whole family. Servers here like to have a lot of fun, and you may be asked to provide some of the entertainment. Food is served family style or a la carte. Specialties: All you care to eat, family style skillets for breakfast and dinner. Banana bread french toast, omelettes, waffles, pulled pork sandwiches, nachos, salads, sandwiches, fish, ribs, pork chops, steaks, bottomless milkshakes. This quick service location had a small variety, although food is made to order and is quite good. Large sandwiches, flatbreads, salads, burgers, chicken sandwiches, and kids' meals are available. Breakfast options include platters, waffles with a choice of delicious toppings, and breakfast sandwiches. Grab and go items and baked goods are available as well. Full-Service Bar-Coffee drinks and pastries are served in the morning; during lounge hours, appetizers and desserts are offered. Full service pool bar featuring cocktails, frozen blended specialties, beer, wine, and sangria. Available from 6:30-11:00AM and 4:00PM-12:00AM. A menu can be found in your room. 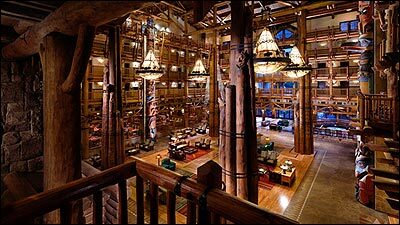 Disney’s Wilderness Lodge is currently undergoing a transformation! You may see or hear work in progress while we create new magic, including enhancements to Hidden Springs Pool, which will be closed from October 26, 2015 through 2017. Certain pathways and other areas will also be closed during construction, beginning in early October 2015. 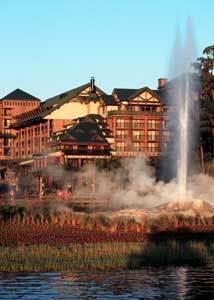 To learn more about refurbishments at Disney’s Wilderness Lodge, please call (407) 939-5277. Swimming: The main pool, Silver Creek Springs, features a slide, waterfall, 2 hot tubs, and a new kid's splash area. Pool towels are available. The pool at the Villas, Hidden Springs Pool, is also open to guests, and features a hot tub. Playground: A playground is located near the beach. Games: Buttons & Bells Arcade is located just outside the lobby, towards the bus stop. Fitness: Sturdy Branches Health Club features a full range of Cardio & Strength Equipment and Free Weights ... as well as Massage Treatments, In-room Massage, Sauna Room and Personal Training. Visit our Health Clubs & Spas Page for more details and rates. Access is complimentary for resort guests. Jogging/Walking paths: There is a one mile path that leads to Ft. Wilderness that is excellent for walking or running. However, it is not well lit, so use caution. Boat and bike rentals: available at Teton Boat & Bike Rentals. Horseback riding and Fishing excursions are also offered. Horseback riding is offered at Ft. Wilderness. Fishing Excursions are offered from the resort marina. 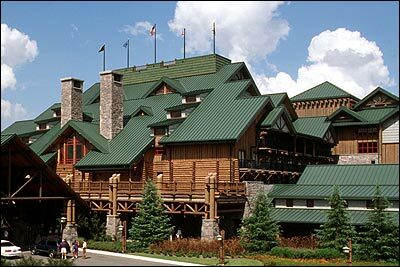 Shopping: Wilderness Lodge Mercantile carries a wide assortment of resort specific merchandise, Disney character merchanise, books, souvenirs, sundries, and food/snacks. The Electric Water Pageant floats by the Wilderness Lodge at 9:35 PM. Boats: Boats run between the resort and Magic Kingdom, as well as in a loop around Bay Lake, stopping at Wilderness Lodge, Ft. Wilderness Campground, and the Contemporary Resort. Boats have a colored flag indicating which route it is operating. Bus: Bus transportation is available to the Magic Kingdom, Disney Hollywood Studios, Epcot, Animal Kingdom, Water parks, and Disney Springs. Buses may share with the Grand Floridian Resort. What floor can I see the fireworks from? 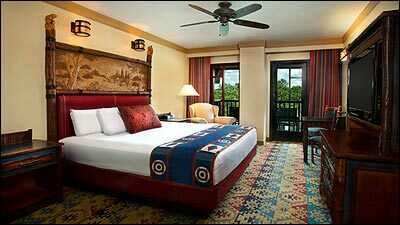 Book a Woods View room and request a room on the Magic Kingdom side on the fifth or sixth floor. 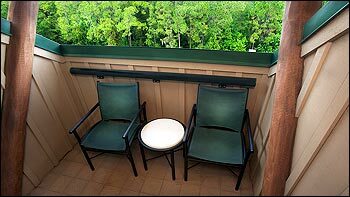 What rooms have closed in balconies? What views can get the noisiest? What is the Closest Attraction? Is there Childcare at the resort? Yes. The Cub's Den offers supervised childcare from 4:30PM-12:00AM. For more details visit our page on Childcare facilities. 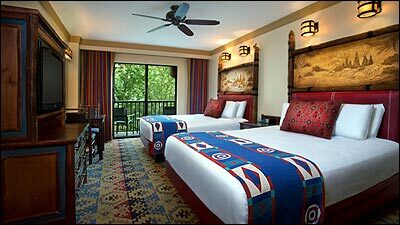 Visit our Disney Vacation Club pages for information on the Wilderness Lodge Villas.